This article is about the OCG/TCG archetype. For the archetype in the Yu-Gi-Oh! ZEXAL anime, see "C" (archetype). For the power, see Chaos (power). "Black Luster Soldier - Envoy of the Evening Twilight" and "Chaos Emperor Dragon - Envoy of the End" in the artwork of "Chaos Seed"
"Chaos" (カオス Kaosu) is an archetype of monsters that thematically combine LIGHT and DARK. It received its first support in the Yu-Gi-Oh! The Dark Side of Dimensions Movie Pack. Due to their Japanese names, several cards, such as "Morphing Jar #2", "Yellow Luster Shield", as well as all "Black Luster Soldier", "CXyz" and "Number C" monsters, are part of this archetype. Conversely, cards such as "Dark Magician of Chaos" and "Envoy of Chaos" are not part of this archetype, as their OCG names do not contain 「カオス」. However, since support for this archetype only works on Ritual Monsters and, in the TCG, supports the "Black Luster Soldier" archetype as well, neither case is an issue. Both "Black Luster Soldier" and "Contrast HERO Chaos" appears in Yu-Gi-Oh! Duel Arena. "Chaos Emperor Dragon - Envoy of the End"
"Chaos Emperor Dragon - Envoy of the End" was the first of this trio to be sent to the Forbidden list, in September 2004, known as one of, if not the most broken card of all time. The card was particularly infamous for its role in the Yata-Garasu Lockdown, a very deadly and broken Deck with the power to use just two cards to absolutely lockdown the opponent, making it impossible for them to play or even see a single one of their cards for the rest of the Duel. "Chaos" still continued to dominate the metagame for the next 12 months. The year 2005 saw a "Chaos Phoenix" Deck using "Black Luster Soldier - Envoy of the Beginning" and "Sacred Phoenix of Nephthys" which proceeded to win the 2005 World Championship, showing that "Black Luster Soldier - Envoy of the Beginning", even if Limited to 1, was still far too powerful to be allowed in the Advanced Format. In September 2005, "Black Luster Soldier - Envoy of the Beginning" was Forbidden (and would remain so for six more years). The next 12 months saw the emergence of the strongest "Chaos" Metagame since Invasion of Chaos. This style of "Chaos" revolved around "Chaos Sorcerer", which was still Unlimited, combined with the flexibility and power of the "Monarchs". "Chaos Sorcerer" was eventually Forbidden in September 2006. The "Chaos" ideal was left untouched until the release of Force of the Breaker, where the "Chaos" era was reborn with the "Sky Scourges", two monsters whose effects were based on "Chaos Emperor Dragon - Envoy of the End" and "Black Luster Soldier - Envoy of the Beginning", with a third that was able to "choose" between the effects of "Jinzo" or "Spell Canceller". Neither of the new "Chaos" replacements made much of an impact, and have long since been condemned to the unused Card Pool on account of their Summoning Conditions being unworkable and situational. More recently, a Deck based around "Sky Scourge Norleras" and "Phantom of Chaos" has been seeing more play after it topped a regional (September). "Chaos" saw a return with "Chaos Sorcerer" being Semi-Limited in the OCG's September 2009 Lists and the use of "Dark Armed Dragon" and "Judgment Dragon". However, "Chaos Sorcerer" was back to being Limited in the OCG's March 2010 Lists. In the September 2010 Lists, "Chaos Sorcerer" was back again to Semi-Limited. "Chaos Sorcerer" has been Unlimited in the March 2011 Lists. However, it was back to Limited again in the September 2012 Lists. 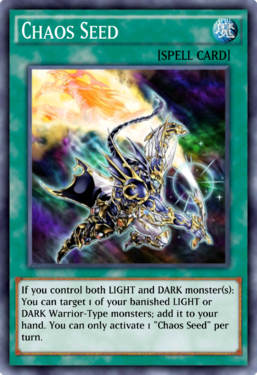 In the following September 2011 Lists, "Black Luster Soldier - Envoy of the Beginning" was Limited after 6 years of being Forbidden. A new Synchro Monster, "Chaos Goddess", was released in The Shining Darkness. It is capable of Summoning Level 5 or higher DARK monsters to the field by discarding a LIGHT monster from the hand. However, the fact that it requires a LIGHT Tuner and two non-Tuner DARK monsters makes it tricky to get out. A museum scene in the Yu-Gi-Oh! ZEXAL anime features an exhibit including the card "Chaos End Ruler - Ruler of the Beginning and the End", whose effect partially merges and upgrades that of both "Black Luster Soldier - Envoy of the Beginning" and "Chaos Emperor Dragon - Envoy of the End". Needless to say, its effect is significantly more powerful and broken than any other card. Given that the card was not even played in the anime and only displayed, it is not expected to ever be released and was likely intended as merely a cameo or reference. This build focuses on milling the Deck to use "Lightsworn" monsters and Summon "Judgment Dragon" while at the same time placing DARK monsters in the Graveyard in order to Summon "Dark Armed Dragon". Since the milling effect can place vital monsters in the Graveyard, the build also makes use of Graveyard control cards such as "Monster Reincarnation" and "Necro Gardna" to make sure that the required cards end up in the hand and Graveyard. With the high amounts of DARK and LIGHT monsters being sent to the Graveyard, "Chaos Sorcerer" can work very well in this Deck, as can "Chaos Necromancer" due to the number of cards that are always being dumped. "Tragoedia" is another important monster for the Deck, offering protection from OTKs, versatility as a Synchro Material Monster and the potential to become a huge beatstick, provided that the player has enough cards in their hand. This page was last edited on 19 March 2019, at 04:52.